With economic growth, banks are more willing to lend, increasing investment. Accelerator theory of investment. This suggests investment depends on the rate of change of economic growth. An improved growth rate leads to higher investment. 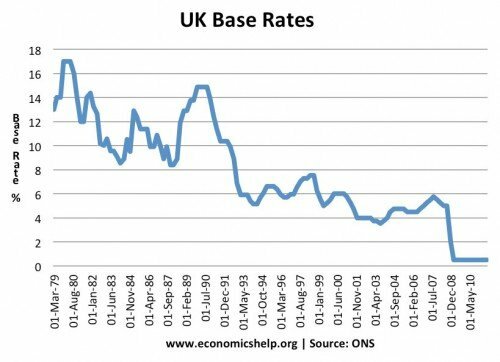 UK base rates increased in 1989/90 caused the economic slowdown. Interest rate changes. When there is higher economic growth, inflation tends to rise. In response, Central Banks tend to increase interest rates to reduce growth and inflation. 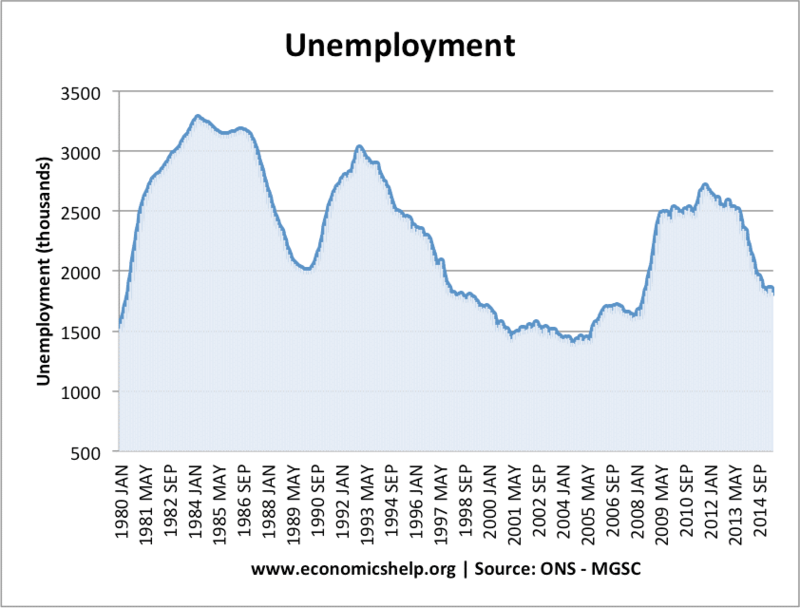 High-interest rates in 1990-92 were an important cause of bringing the economic downturn. High-interest rates made mortgages expensive, reducing disposable income and causing a rise in home-repossession rates. Technology. Improvements in technology may cause a boost in economic growth. A lull in technological innovation may cause slower growth. Global Trade Cycle. A global economic downturn will tend to affect individual economies. The recession of 2008/09 occurred in all major global economies. Fluctuations in economic growth have an important influence on other macroeconomic variables. – In a period of rapid economic growth and rising consumer spending, we tend to get a rise in imports which causes a deterioration in the current account. 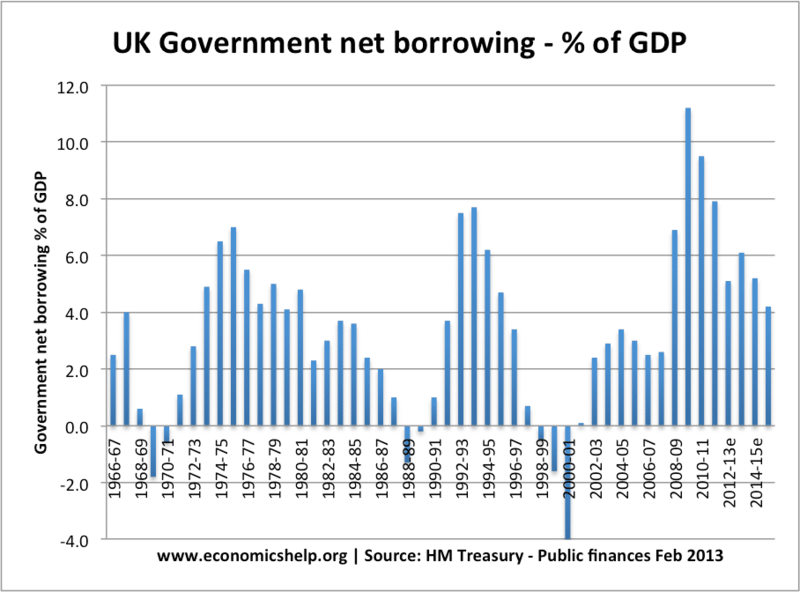 In a recession, government finances tend to deteriorate leading to a larger budget deficit. Tax revenues fall. Less spending – less VAT. Lower incomes – lower income tax. Higher welfare spending, e.g. unemployment benefits. Some economists feel that there is an inevitability of a trade cycle and the government cannot influence and prevent recessions. 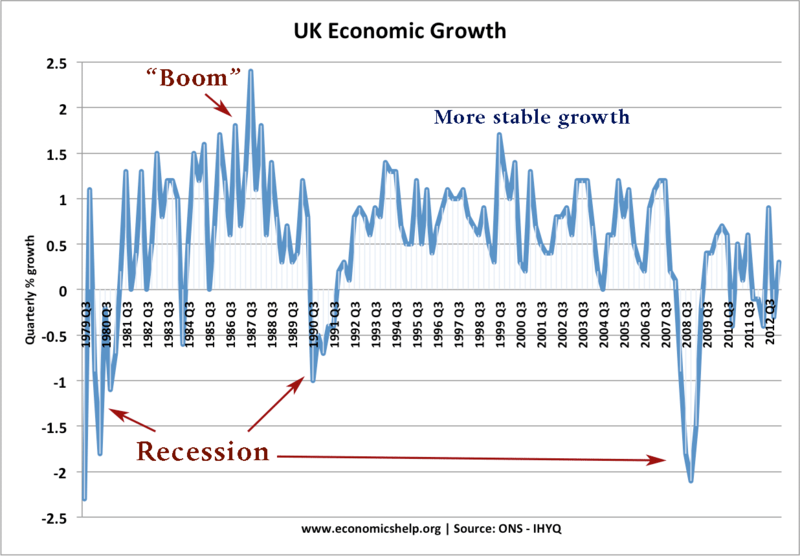 However, other economists (such as Keynesians) argue that government intervention can help overcome recessions. Expansionary fiscal policy – Higher government spending and/or lower taxes financed by borrowing. This should provide an economic stimulus. Also, the Central Bank can provide monetary easing – lower interest rates and/or increasing the money supply. 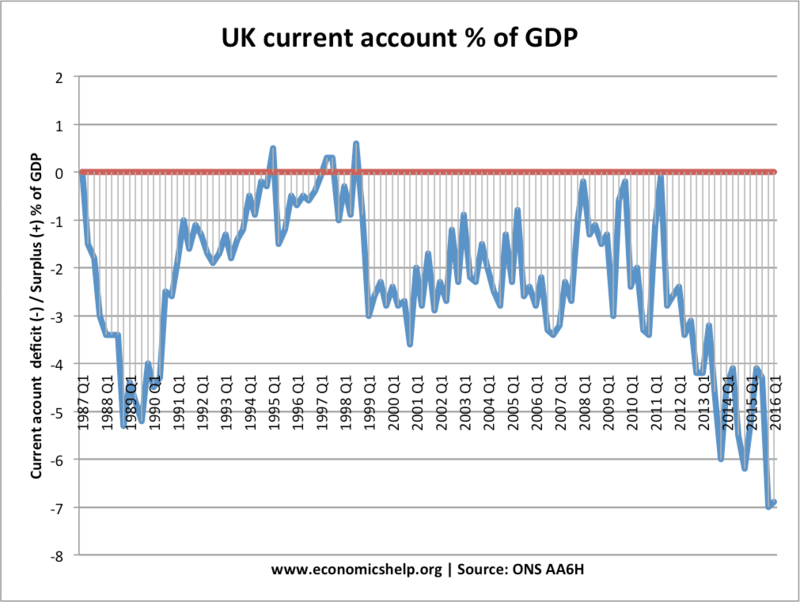 Between 1997 and 2007 the trade cycle was more stable in the UK. 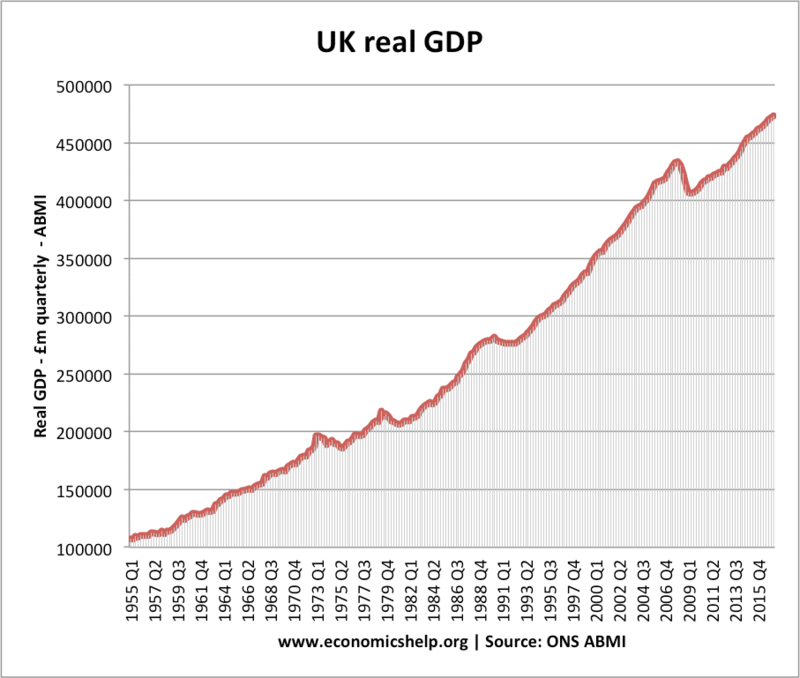 However, the global financial crisis pushed the UK economy into recession during 2008/09. 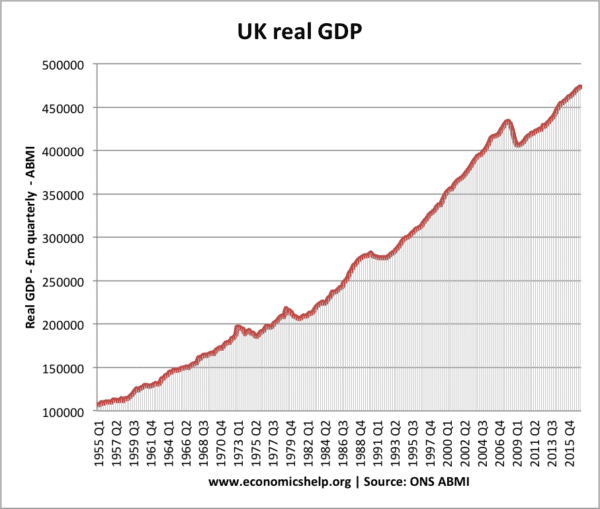 If economic growth is slow and actual output grows slower than potential – there will be an increase in spare capacity. 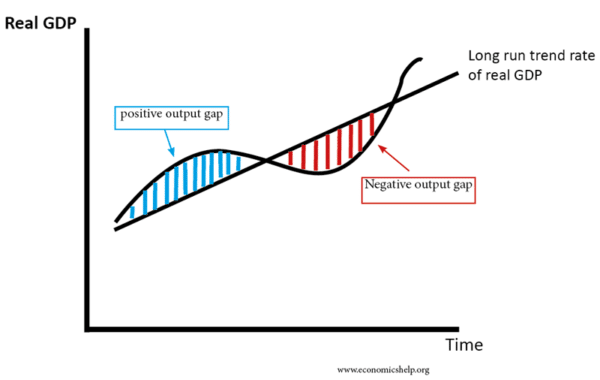 This will cause a negative output gap. With fast economic growth and increases in AD then the output gap gets smaller and can become a positive output gap. 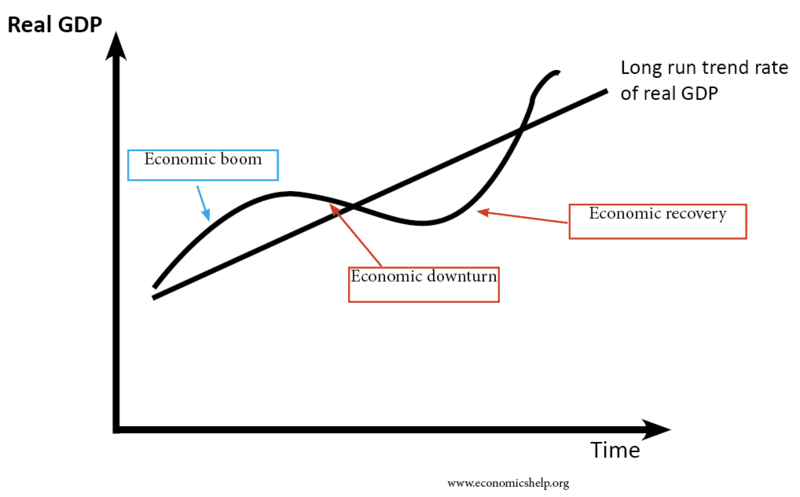 The long-run trend rate refers to the average sustainable rate of economic growth in an economy. For example, in the UK this is about 2.5%. This depends on the growth of AS and productive capacity.